National Portrait Gallery: unveiled BP Commissioned Portrait of Dame Kelly Holmes by Craig Wylie. A new portrait of Double Olympic Champion Dame Kelly Holmes has gone on display at the National Portrait Gallery. The portrait is the work of artist Craig Wylie, and was commissioned as part of the First Prize in the BP Portrait Award 2008. This portrait joins others in the National Portrait Gallery‘s Collection of Commissioned Portraits of BP Portrait Award winning artists. A selection of First Prize winners for the last two decades was on show during the “BP Portrait Award 2012”. Dame Kelly Holmes portrait is a large-scale (172 cm x 115 cm) head and shoulders oil painting. The size of the work is important to the artist, who says that the act of painting creates ‘a kind of hyperreality through amplification’. Sittings for the portrait took place in late 2011 during which Wylie took a number of photographs of Dame Kelly Holmes from which to work. The portrait has a narrow format with the sides of the canvas cropped close to the edge of the sitter’s head but leaving space above. With this approach Wylie hoped to focus the attention of the viewer on the sitter’s gaze. The portrait evokes a sense of reflection and represents Dame Kelly in a commanding yet personal way. Dame Kelly Holmes (b.1970) began athletics at the age of 12 in Tonbridge, Kent, and twice won the English Schools 1500m (1983 and 1987). She joined the British Army at the age of 17 and qualified as an HGV driver before training as a Physical Training Instructor. Dame Kelly left the army in 1992 as a sergeant after being awarded an MBE for Services to the British Army. During her time in the Army she had gone back to international athletics and in 1994 won the 1500m at the Commonwealth Games. Despite suffering several years of injury, Dame Kelly won medals at the Commonwealth Games, European Championships, World Championships and Olympic Games including a bronze medal at the 2000 Olympics in Sydney. She achieved her ultimate ambition of winning Olympic gold twice in Athens in the 800m and 1500m. Dame Kelly retired from athletics in 2005 and in the same year was made a Dame Commander of the Order of the British Empire. She is Founder and Chair of the Dame Kelly Holmes Legacy Trust, a charity that seeks to create life chances for young people through personal development programmes. She also runs her own company, Double Gold, managing a range of education and mentoring programmes and has her own fitness range. Dame Kelly is President of Commonwealth Games England and Official Ambassador for Team GB. Craig Wylie (b. 1973) was born in Zimbabwe and studied Fine Art at Rhodes University, Grahamstown, South Africa, graduating with distinction He moved to London in 1998 and, after exhibiting at the BP Portrait Award for three successive years he won First Prize in the competition for a portrait of his girlfriend, Katherine Raw in 2008. Alongside winning other prizes for his work, Wylie has exhibited internationally including recent exhibitions at Contemporary by Angela Li, Hong Kong, Galerie Dukan Hourdequin, Paris, Neuer Kunstverein Aschaffenburg, Germany and Plus One Gallery, London. Sandy Nairne, Director of the National Portrait Gallery, London, says: ‘This is a compelling portrait of a sitter who has made a very significant contribution to British sporting history and whose achievement is inspiring to so many’. 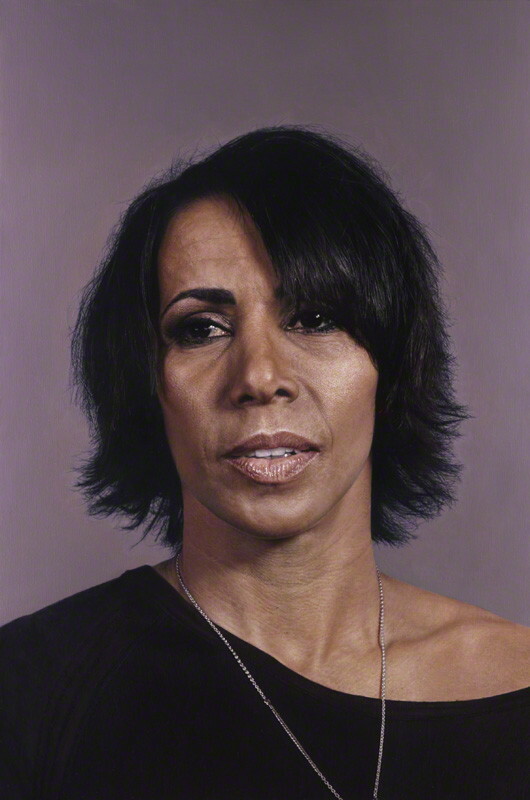 Des Violaris, Director, UK Arts and Culture, BP, says: ‘We’re delighted that this stunning portrait of Dame Kelly Holmes by BP Portrait Award 2008 winner, Craig Wylie, has gone on public display. The commission illustrates how the BP Portrait Award provides future opportunities for individual artists and promotes contemporary painted portraiture. The new portrait marks Dame Kelly’s significant achievements and we hope it will be enjoyed by many’. Dame Kelly Holmes by Craig Wylie is on display at the National Portrait Gallery’s Contemporary Collections in the Lerner Galleries, Room 36. At the National Portrait Gallery, St Martin’s Place, London. « Commissioned Portrait of the “BP Portrait Award 2012” at the National Portrait Gallery.